You’ve just finished your summer build and are excited to fly. To capture this moment, you want to strap your RunCam aboard your new quad and get some great footage! 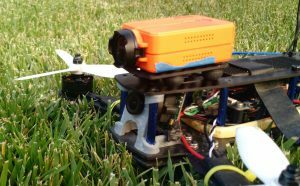 When you do however, you notice that it doesn’t sit at the same angle as your FPV camera. 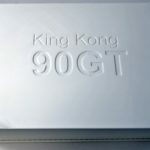 You may already have invested in a protective case, but you didn’t think you would also need some sort of platform to adjust your camera angle. What to do? 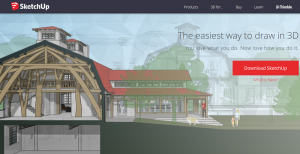 This is where 3D printing and CAD tools like SketchUp come into play. 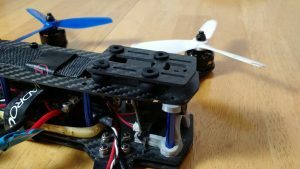 We make tons of small choices when building our quads that make them unique at the end of the build. Being able to create our own custom odds and ends in CAD software can help make our builds even better or solve problems we didn’t expect. The camera angles don’t quite match using the stock plate. 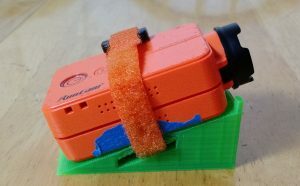 In this article, we are going to walk through the process of designing, building, and printing a wedge for an action camera. This should be an easy introduction into thinking about the design process, using SketchUp, and then preparing the file for print. For this example, we will use my ZMR 250 as the reference frame. First thing we need to do is sketch out what we want to design on pencil and paper. Having a guide to reference and build from is so much easier than trying to start from scratch on a blank software window (for me at least!). Similarly, working out small issues that come up with angles or layouts are much easier to rework with an eraser rather than undoing the last ten steps of your model within the software. If possible, use graph paper to make the layout as clean as possible. Pencil will be our tool of choice. Easy to erase and make changes as necessary. Calculate out specific angles and measurements to make your life easier once you get into the software. Having everything already listed out will make the building process much faster. 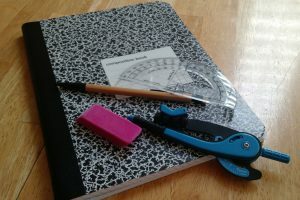 Remember compasses and protractors from elementary school? They can be super helpful here to draw or measure angles correctly. Calipers are extremely helpful when measuring out what you are modeling. They will give you precise measurements for almost anything you can throw at them. We highly recommend this easy to use digital caliper. So for our wedge example, here is my pencil and paper drawing. I first measured out the ZMR camera plate and used that as my base. I drew a simple triangle with some holes in the side for Velcro straps to hold down the camera. At the front of the ramp, I put two notches to hold the RunCam in place so it doesn’t go flying forward. In a real world example, you would want to put your RunCam in a protective case – which could be your next design project! Simple scratch drawing to help serve as a guide when we build it in software. To secure the wedge to the frame, I built some holes underneath that will connect to the open area created by the space for the Velcro straps. The idea here is that there won’t be much room to make another set of holes parallel to the side plate, so I will simply secure it underneath. Similarly, with the vibration damping balls in the way, it will be hard to get enough room to easily secure it if I went around the sides. Luckily, the camera plate has some holes beneath it that I can run a zip tie through, loop around, and secure with a few zip ties. You will definitely want some sort of protective case for your camera – but that’s for another guide! 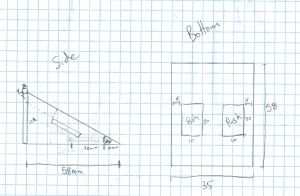 Now that we have an idea of the measurements and a rough sketch, let’s open up SketchUp and build the thing! 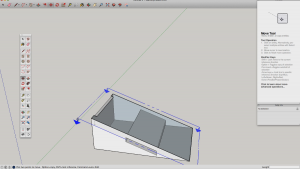 There are thousands of SketchUp tutorials, so for the sake of keeping your interest I will just cover the basics to make this wedge and give you a quick and dirty rundown of the software. First, we will need to select a template and measurement style to use. You can search for the printer that you will be exporting to, but since the model is so small and we don’t have to worry about size limitations, just select the default profile to get started quickly. Before we start drawing, let’s do two things to make our lives easier. First, we want to enable the ‘Large Toolbar’ by going to View > Toolbars and selecting the ‘Large Toolbar’. 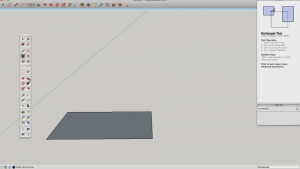 This toolbar will have almost everything you need to make basic models in SketchUp. 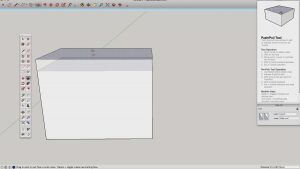 Next, download the SketchUp STL plugin from the SketchUp website (linked here). This will allow you to import and export STL files. Most of the files you download from repositories like Thingiverse will be STL format. The base installation does not include this functionality, so it is recommended that you install it. 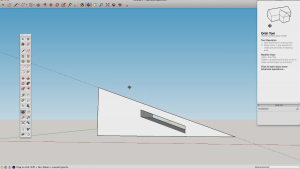 SketchUp has a great series of videos detailing all of the basics you need to get started, but for our example, we are just going to focus on the big picture concepts of the application and the specifics we need to complete this project. I would recommend watching the tutorials first, but if you just want to dive in and experiment, keep reading. Click, drag, click to build your first rectangle! 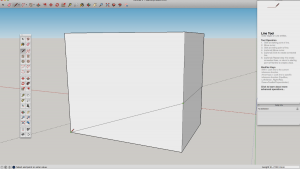 SketchUp uses a ‘click’, ‘perform action’, ‘click to complete’ series for most of the commands. If you want to draw a rectangle, you would select the rectangle tool, click where you want the selection to start, use your mouse or keyboard to resize the rectangle, and then click to complete your rectangle on screen. Play around with this and you will get the hang of it really quickly. 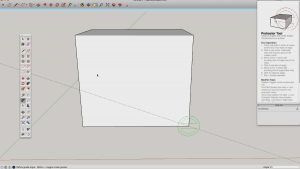 One important tip though – for any shape or drawing tool in SketchUp where you are performing the action (i.e. between clicks) you can type the dimensions you want on your keyboard and press enter to complete the action. This is super helpful if you already measured out your design before starting (which we did of course!). For shapes with multiple dimensions (rectangle for example), you would enter the length, then a comma, then the width, and press enter. This will create the rectangle to your desired measurements. 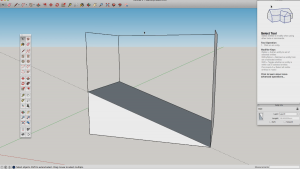 Another important concept in SketchUp is understanding inferencing. When you draw from point to point, you can inference another section of your model by hovering over that area to help “match” the settings. For example, you can do this with the push/pull tool by selecting the area you want to push/pull and then hovering over another face of your model to match the height of that selection. Similarly, when drawing with the pencil tool, you can select your starting point and then hover over another line to find things like the midpoint, or drag away to draw a parallel line. Finally, we need our model to be “whole” (think watertight) for it to be printable. If there are open areas on the model, our printer will have no clue what to do with the file and the print will likely fail. Before exporting, look around your model for any odd geometry or see-through spots that could cause issues. The tools you will use most are the rectangle, push / pull, and pencil tools. The rectangle and pencil tools are exactly as they sound – the rectangle tool allows you to build a rectangle and the pencil tool allows you to draw a line. The push / pull tool allows you to select a face that you drew (a rectangle for example) and push / pull it up or down to give it volume. You can play around with the rectangle tool to build a platform like we drew by using length 58 and width 35. Once done, select the push / pull tool and move it upwards. Now you have a big block to work with! From this point, we can use the protractor tool to measure out the angle we need. Simply select one end of the base of the box, select the other end of the base of the box, and you will see the angle move. Type in the desired angle, 20 for our example, and press enter. Now we have a measurement of our angle. Next, we can use the pencil tool to draw in the outline of the angle. Starting from the angle guide we just made, use the pencil to go from point to point around the box to draw out our wedge. Using inferencing (hovering over the line you will draw to) you can find the intersections easily and won’t have to use the protractor tool again on the opposite side. So now we have our basic frame. Select the faces that we don’t need (the upper sections) and press delete. This will delete all of the unnecessary faces and leave us with our wedge! Complete by deleting all of the leftover lines. Now we have our basic wedge! We can now add the details we designed out. To measure out the distances we drew on paper earlier, use the tape measure tool. Similar to the protractor tool, this will allow you to draw guides that you can later trace over with the pencil tool. Once we have drawn out our basic shapes, it’s time to use the push / pull tool to complete them. For the Velcro strap hole, all we have to do is select the push / pull tool, click the area we drew for our Velcro holes, and push through until the icon says ‘on face’. Click to complete, and you will be left with a nice clean void where our Velcro cables will pass through! 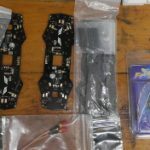 Similarly, you can pull from the front of the wedge to build our RunCam front guards so that it won’t fly off when crashing. Again, select the push/pull button, click on the front face, and pull outward. To make things easier, you can type in the distance you want the push/pull to move by typing in the distance while the face is selected and pressing enter. Now the tricky part – creating the open areas for our zip tie underneath. 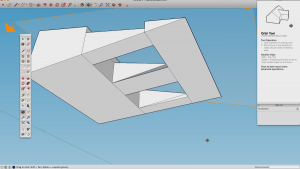 There are a few ways you can accomplish this, but to use more of SketchUp’s features, we are going to use the section pane tool to “see through” our model. After selecting the section pane tool and placing it on our model, you will notice a box with arrows placed on the screen. You can use the move tool to move these arrows up and down to see different sections of the model. With this, we can move from our flat ramp, down to the channel we cut for our Velcro straps. Neat right? Now that we have done that, we can draw out the rectangles to cut to the bottom for our zip ties. Here’s the issue though – because we built the Velcro holes at an angle, the push / pull tool won’t play nice with the bottom of the model. The quick and dirty way to fix? We delete the faces we drew for our zip tie slots, exposing the inside of our model. Obviously we need to fix this before printing, because now our model isn’t one whole surface. To do so, we simply use the pencil tool to draw in new faces using the cut out rectangle as a reference point. Once completed, you will see the faces reappear. Delete the bottom face, and you will be able to see the entry and exit for our zip ties. Success! That’s it for our basic model. In building this, we have used nearly all of the basic tools and hopefully got a better grasp of how to use SketchUp. For finalizing – we want to check our model to make sure that everything is closed up and ensure we don’t have any holes. You can do this by doing a quick orbit around and checking for any gaps. Once you feel comfortable, go to File > Export STL to export our model for printing (this is assuming you installed the plugin). Time to bring your hard work into reality! The STL file should be more or less universal when printing on a home printer or printing service. 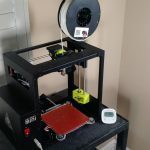 Want to learn more about 3D printing, including information on locations where you can get your creations printed? Check out last week’s article for more information! Similarly, you can share your design with other hobbyists on sites like Thingiverse. Here is a time-lapse on our printer of our creation coming to life! Similarly, here is a video we created outlining the entire process! 3D modeling / CAD doesn’t have to be an intimidating process. 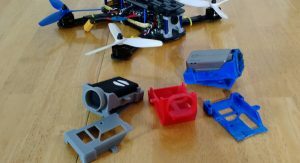 Tools likes SketchUp can make the process easy for printing simple parts that make your quadcopter even better and more unique to you. 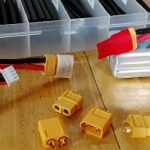 The best part is that there are a ton of free tools that hobbyists can use to create interesting new parts at a minimal cost. Hopefully this has been helpful in covering the basic process for taking concept to reality. Interested in more information on the subject? Feel free to let us know in the comments below what else you would like to see.